Grace Warnock's sign shows how not all disabilities are visible. Rail bosses have backed a young girl’s campaign to raise awareness of invisible disabilities, after she experienced abuse from strangers for using an accessible bathroom. Grace Warnock, who has Crohn’s Disease, invited a new toilet sign to highlight that not all medical conditions requiring extra support are immediately apparent. 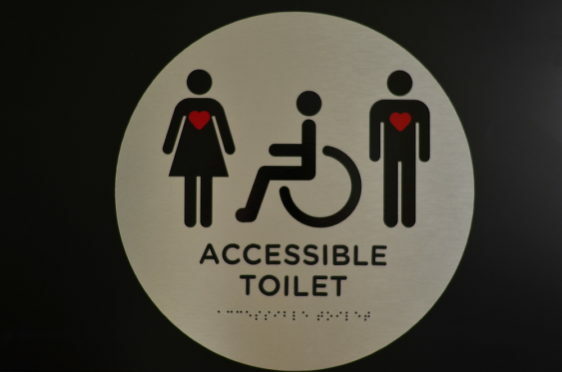 The 13-year-old’s design includes a person in a wheelchair and a standing person with a heart, symbolising that some disabilities are internal and can’t be seen. The innovative signs can already be seen at key locations including the Scottish Parliament and V&A Dundee. And ScotRail has confirmed it is backing the campaign and will install Grace’s Sign at all of its train stations, including those in the north and north-east. The rail operator’s access and inclusion manager, Andrew Marshall-Roberts, said: “We are committed to making Scotland’s railway open and accessible to all and installing Grace’s Sign at our stations is just one of the ways we’re doing that. ScotRail is also trialling pin-badges to make priority passengers – including those who are disabled, pregnant or less able to stand – easily identifiable, encouraging customers to be more considerate of their needs. So far it is being rolled out at stations between Edinburgh and Glasgow, with the prospect of more stops being added if the project is successful.